Product #11874 | SKU 0S1400-0003-130 | 0.0 (no ratings yet) Thanks for your rating! 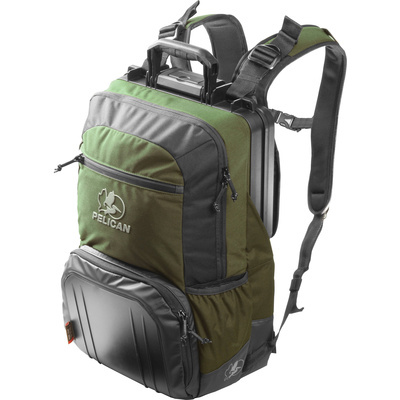 The green on black S140 Sport Elite Tablet Backpack from Pelican delivers excellent storage capability for your iPad and laptop. Your iPad can be stashed inside its own touch fastened interior compartment. Your laptop is safely held inside a rear located watertight and crushproof ABS storage compartment that rests against your back and is supported by adjustable floating shoulder straps and a padded, ventilated lumbar area. For extra protection, a very rigid front plate is provided to guard against incidental contact that is inevitable when you are out on the road. The pack is made from strong 600D Kodra Nylon material with plenty of interior space for your collateral material or photo gear within its 20.5 litre zippered main storage area. Inside the pack you'll find a slip-in pocket for manuals as well as a compartment for, perhaps, a sweater. A zippered mesh storage pocket is provided for your computer cables, charger and other support equipment. The S140 also features a removable hip belt that is used for additional support while travelling. A snap coupled sternum strap helps provide balance and stability while walking. A rigid top carry handle is also included for quick grab moments such as removing the pack from your car or luggage rack. The S140 is backed by Pelican's lifetime warranty against breakage and manufacturer's defects.